The dash for Start Point starts tonight! The four leading crews in GBRow 2013, the world’s toughest rowing race are now at anchor or battling against the tide south of the Isle of Wight. This evening the leaders will head to Start Point near Salcombe in Devon after rounding the south of the Isle of Wight. The Islanders, Josh Taylor, Alan Morgan, James Plumley and Gavin Sheehan, in the Black Oyster are still in the lead, not far off World Record pace. Black Oyster is 11 miles ahead of Team Hallin in Hallin Marine II, led by David Hosking, who have spent the day being pursued the crew of six in Oarsome Adventures. 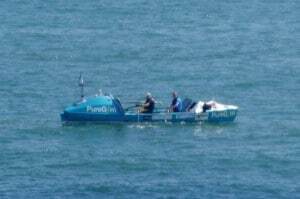 While OA are just eight miles adrift of Team Hallin, after making up ground lost when their boat, Boudica, developed mechanical problems yesterday. Pure Gym are currently fourth, 11 miles behind Oarsome Adventures, near Worthing. The Savoir Faire pair of Jason McKinlay and Josh Tarr have passed Beachy Head and are hugging the coast near Eastbourne to avoid the worst effects of the turning tide. And the Coast Girls have battled all day against a head wind in the Thames Estuary and have been forced to anchor when the tide changes. Tonight they will head for either Palm Bay or Botany Bay on the Kent coast. Tomorrow they expect to be fianlly in the North Sea to take advantage of a tail wind.